A giant puzzle of pathways, the Maize Maze will test your powers of deduction to the limit. Will you be able to find the 8 sea creatures hidden with the Maze? Collect all 8 stamps on your activity card to receive your lollipop. 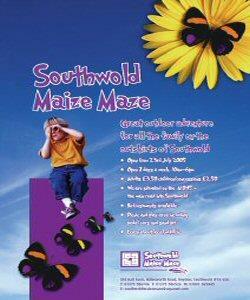 Southwold Maize Maze offers exercise, education and enjoyment for all the family so come and enjoy the fun!! We provide everyone with maps and we suggest wearing flat soled footwear in the maze. Unfortunately we cannot cater for dogs on site. Push chairs recommended for under three's! This is an outdoor venue, and therefore its accessibility for the disabled is dictated to by the weather and ground conditions. Gates open at 10am and close at 6pm with last entries into the Maze at 5pm. Adults £4, child £3, senior citizens £3, family ticket £12. Under 3's free! Special rates for groups available on request. We are situated on the main A1095 into Southwold which is the main road into Southwold off the A12.